Moles can be one of the most infuriating pest problems you are likely to face. I had a beautiful lawn one day, then the next, my perfect lawn had ridges and holes all over it, with fresh holes and bumps appearing almost by the minute. As all the activity was taking place underground, I never saw the mole; I just saw the effects of its burrowing through the soil close to the surface. That’s when I started investigating the best mole traps! Our favorite trap is the Wire Tek 1001 , and we have provided a very in-depth review of this product. It’s a rather vicious looking contraption, but it gets the job done where others fail. This trap retails at around $33, and when you are desperate to get rid of moles, you’ll see that as a real bargain. However, if you feel that is a bit high for your budget, you’ll be pleased to note we have also reviewed two other traps that are a little less expensive. We haven’t gone into as much detail on these, but enough for a good overview. We hope you agree this approach of an overall detailed review is ideal for letting you know all you need about eradicating moles, and making the right buying decision for you. What should you look for in a mole trap? What makes the Wire Tek 1001 so efficient and safe to use? How does the Wire Tek 1001 work? How do you empty and clean the Wire Tek 1001? What are the main features of the Wire Tek 1001 ? What do customers think of the Wire Tek 1001? Where can you buy the Wire Tek 1001? Straightforward and simple – a trap that removes all the guesswork from trapping moles. Safe to use – no poisons or chemicals used in the trapping of moles. No extra work – a trap I can set directly into the mole tunnel without having to dig. Safe to handle – no dangerous sharp prongs or setting tongs that could injure me, or my children or pets. Easy and dependable – a trap that’s easy to use and effective every time. Traps come in several varieties. This mechanical trap is actually a rather scary looking device. It has two pairs of “scissors,” separated by several inches, that are sunk into the ground, directly in a tunnel, then the trap is set by depressing the setting lever. When the mole comes along in either direction, it will activate the trap, and that will be the end of your troubles with that particular animal. If you have more than one mole wreaking havoc on your lawn, you will need to set the trap several times in different places, or just get several traps and set them all at the same time. One thing you should understand is that there can be from three to seven moles all operating in an area of about a quarter acre. That’s the size of a fairly large backyard, for example. Each mole will have his own territory, and he is a very determined little fellow at keeping his territory too. That’s why ultrasonic repellers don’t work very well for a mole that has become established. The mole doesn’t like the sounds they make, but if he’s established in his own little territory, he will cling to it like glue, come what may. Ultrasonic devices are much better at deterring a mole from moving in, but not for getting rid of one that’s already there. For that you need something much more powerful, something like the Wire Tek Easy Set 1001 trap. Would I say it’s the perfect trap? Well. that depends, but for moles that are well established in their own little territory, then yes, I think the Wire Tek 1001 is about as good as it gets. There are a few negative points you should be aware of, and I will touch on these later, but if you want to stop moles churning up your garden, this is the way to go. The thing I like best about this product is the fact that I don’t have to dig chunks of earth out of my lawn in order to set the trap. I don’t have to handle poison, or other nasty chemicals either. I don’t even have to guess what I’m doing. All I need is to identify the mole tunnels, and I can see them all over the lawn. With that established, setting the trap takes a couple of seconds – by sinking it into the ground with your boot. You won’t have too long to wait before the trap goes off. It may be a few hours, or even more, but sooner or later Mr Mole will come by sniffing out worms, and he will set it off and will be killed instantly. That will be the end of that particular problem. If you have more than one mole causing you a headache, then all you need to do is set the trap again and wait. 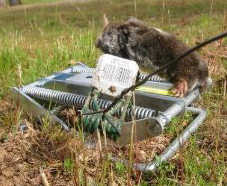 If the dead animal has been in the trap for a while then you may need to clean the trap before setting it again. The Wire Tek is safe to use too. Although it has iron jaws which give it greater strength and durability, they are not open and able to chop off the odd finger accidentally until the unit is firmly set in the ground. For this reason the device is perfectly safe for you, and for your children and pets. Some traps operate through having sharp locating prongs that are a constant threat for anyone handling the trap, but that’s not the case here. One other very important thing to remember to make the Wire Tek as efficient as possible, is to always use disposable gloves when handling the trap. Moles have a very good sense of smell, and they don’t like the smell of us humans at all. If they come across a trap that smells of you, they will likely avoid it, thereby severely limiting its effectiveness. If you do touch it, you can get rid of the human smell by boiling the entire device in a large pot in slightly soapy boiling water for a few minutes. Yes, really! The manufacturers claim it is “the most effective mole control product on the market,” and that it is “effective on all species of moles worldwide.” I don’t know about you, but that’s exactly the kind of trap I want to have! The basic idea behind the Wire Tek 1001 is simple enough. The scissors mechanism is activated by the mole, and it snaps shut around his body, eliminating the problem instantly. There are two scissors mechanisms set up in parallel to cover each direction that the mole might travel though the tunnel. You set the trap by first locating a section of the tunnel, pushing the scissors mechanism, which are closed at this stage, into the centre of the tunnel firmly, until the base part of the trap is touching the ground. Then you step on the setting lever, which sinks the scissors mechanism underground in the tunnel. Than all you need do is wait until a mole has activated the trigger, which will snap the scissors tightly shut. You will know when the trap has been activated, as it will pop back up off the ground, so to speak. When it is set, waiting to be activated, the trap will be flush with the ground, but when the trap has been activated, the mechanism goes back to its state before you set it, which means it will be lifted off the ground again, and visually obvious. Perhaps the hardest part of using the Wire Tek Easy Set Trap is to know which part of the mole tunnel system is actively being used. There’s little point in setting the trap where a mole won’t be going, after all. One way is to collapse all the tunnels you can see. Do this simply by stomping it flat. The mole will re-tunnel through the parts it wants to, so when you see a part of the tunnel that has been raised again, you will instantly know where the mole is likely to be before long. That’s where to set the trap! Once the mole has been caught, you will need to dispose of the body. That is achieved by depressing the setting lever to open the scissor mechanism. If you do this over a trash can or bag, then the mole will slip right in, and you won’t have to handle the body at all. You should clean the Trap after every kill. You need to be extra careful when cleaning the scissors part of the trap. You could easily injure yourself if you are not careful. It is best not to actually touch this part when cleaning. Use a water hose to remove dirt and let the device dry naturally. Remember not to touch the trap with your bare hands. Use disposable gloves when handling the trap. What are the main features of the Wire Tek 1001? 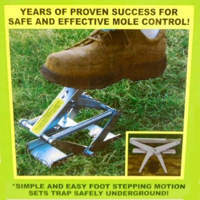 You don’t have to guess where to use the trap to clear the moles in your lawn. You don’t need to dig up any part of the mole’s tunnel system or runways. There are no poisons or dangerous chemicals to handle. There are no sharp prongs needed to anchor the trap, which could cause you accidental harm. It’s perfectly safe to use. It’s fast and very easy to set. It’s very efficient at eliminating moles. User feedback, the short reviews you find in some retail stores online that have been submitted by actual customers of the product, are a wonderful aid for helping you make your mind up about whether or not to buy the device. Customers tend to be honest in their reviews, so when they are pleased with their purchase, they say so, usually with lots of exclamation marks. When they are not pleased with their purchase, they also say so in no uncertain terms, and they usually have lots of exclamation marks in those reviews too. In short, customer reviews tend to be the honest opinions of people who have experience using the product. What more could you ask for? Your experience may differ from others, and it probably will too, but knowing how others fared is always a good thing. The Wire Tek 1001 has received a lot of reviews in online stores, especially in Amazon. They have 86 customer reviews at the time of writing, and those customers have scored the Trap 4.3 out of 5 stars on average. That’s a very respectable score. You will save money by not having to get specialist pest control trappers. You can typically expect one mole caught every 24 hours when you use the trap properly. It has a strong, rugged assembly that will last for years. The trap is very heavy and the pressure required to spring the trap is far beyond what the average mole is going to put on it. This is not what other customers have reported. They have nearly all said that the trap is easy to spring. Perhaps you need to check over the mechanism. Tree or plant roots, that the mole seems to have no problem with, will prevent the jaws from opening when you are attempting to install it. That makes sense, so avoid areas where tree and plant roots can be seen. This trap is designed to catch a fox not a mole. I’m not sure what to say here. Foxes don’t burrow under lawns, so this trap would not be very effective for catching foxes. It catches moles though! I think this design of trap is probably adequate for thick turf and loamy areas and not for the soil type I have here in S. Oregon. This is not what other customers have said. Some soils may be better than others for this trap, but it is designed for use in all conditions, including sandy soil, and others have reported good success in all kinds of different soils too. 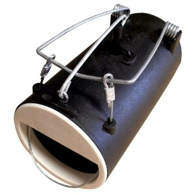 The Wire Tek Trap is designed to catch moles as they run along an active tunnel. It uses a scissors mechanism that is set once the trap has been inserted into the centre of the tunnel. There is a trigger plate that activates the scissor mechanism as soon as the mole steps on to it. The trap is very powerful, and if used properly, you can expect to get 100% efficiency. This assumes you follow the manufacturers instructions, and that you do not handle the trap without using gloves to avoid getting a human scent on the trap. There are a number of retail store selling the it, both online and offline, but we have found Amazon to be the best place for purchasing the Wire Tek Trap. They have a super-saver free shipping offer that will apply to this product. That means you will have nothing else to pay, other than the asking price, if you buy through Amazon. Also, Amazon are well known and very well respected. They are a trustworthy company that people like and you can read lots of customer reviews. Their returns policy is next to none in the retail world, which is good to know, should you ever have to use it. Amazon also usually offer the best deals around too. 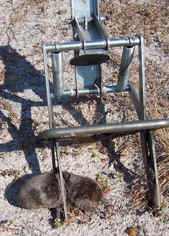 The Black Hole Trap is really aimed at gophers, but it works well for moles, and even rats too. This trap requires a bit more work to set than the Wire Tek 1001, but it is very effective, and it is perhaps a good choice for the more budget conscious. You have to locate an active mole or gopher mound, then you need to dig up the tunnel carefully, exposing it, place the Black Hole Rodent Trap in the exposed tunnel, sealing any cracks and light leaks with loose soil. Also cover the trigger cable with soil. You should bait the trap by dropping suitable bait into the Black Hole through the vent hole on top. 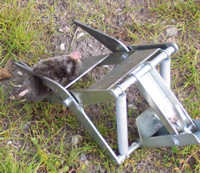 A small amount of bait sprinkled at the mouth of the trap could help to entice the mole into the trap where it will activate the trigger. You can set this trap easily and without much effort. You don’t need to use dangerous poisons or gases. When set properly, the trap is extremely effective. You can buy it in many stores online, but we recommend you purchase the Black Hole Trap from Amazon. The price of the Black Hole Trap is below their super-saver free shipping level, but if you bought another item for $10 or so, you would get free shipping. Amazon is a trustworthy company that people like because you can read real customer reviews. They are efficient and dependable too. The Nash Choker Loop Trap is a device that works by cutting two slots into an active tunnel. 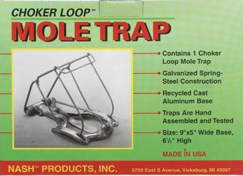 The trap is lowered into the slots in such a way that the choker loop is ready for an unsuspecting mole to come along. When it does, it triggers the trap and that’s that! The trap is made from sturdy, long lasting steel. It’s easy to clean and easy to set and use too. Reading through some customer reviews, I find this trap to be a favorite among those with a mole problem. Some say it’s more difficult to set than some other traps, notably the Wire Tek 1001, but once you get the hang of it, it works great, every time. The Nash Choker Loop Trap doesn’t need bait, and you don’t use poisons or gas either. You just set the trap in an active tunnel, and that’s that. It’s a very sensitive trap, however, but that’s a good thing, and it’s really quite easy to set it without triggering the mechanism. It’s easy to set and operate. It’s safe to use when you have children or pets around. It’s strong, made from galvanized steel with an aluminum base. It’s very easy to clean, and it needs next to no maintenance. You can buy the Nash Trap from Amazon. In fact, we recommend you buy it there as their service is excellent and totally headache free, there are also plenty of customer reviews for you to read to help you make your decision. This product is priced just below the threshold for super-saver free shipping, but you could purchase something else for a couple of dollars, and that would tip it over the free shipping threshold, and you would get it sent free – right to your front door. You are looking to create a mole-free zone. If they are in your neighbour’s land, then probably not very long. Talk to your neighbours, teach them how to eradicate moles and hopefully this will put a buffer around your land. I use petrol (what is known in the US as gasoline) quite effectively. I first remove the molehill, check the directon of the tunnel(s) and then use small funnel and short hosepipe (15 inches) to direct a cupfull of petrol down each tunnel. I cover over that molehill with dirt and move on to the next molehill. I do that to all the molehills as they appear for a few days, the moles seem to hate the smell (moles hunt by scent) and they go away. After a few months another mole may arrive and use the same tunnels but I give him the same treatment and he/she also goes away. Great tips. Thanks for sharing with us. Another animal that doesn’t like gasoline is a fox, if you put it around the entrance of their lair, they won’t go in. I inherited several “cinch” traps that have a pincer mechanism and a trigger that you put down the tunnel. They seem to fill the hole but they still cover them with dirt without setting them off. Make sure the trap fits nicely in the hole. It should be a snug fit. How do you UNSET this mole trap? I want to move it to a different location but don’t want to pull it out while still in the “jaws open” mode. Put a stick in it and trip the mechanism. I have been making a strong ‘tea’ using Japanese chilis and pouring it down the gopher hole, hoping it will burn their nose and they will go away. Any chance that will work?? I would guess slim to none but please let us know if you are successful. OK, they can’t see very well. Moles are only blind to the damage they do while searching for food etc. Always kinda sickens me hearing people who have never dealt with moles, “tree hugger” type, commenting about how that’s “mean” cruel” etc to kill them. Obviously these people have never had them destroy their entire lawns, and property that they personally create from nothing. Where as when they go outside and find the stray dogs have dragged garbage all over the place, they just wanna kill em. Well, i wish my biggest problem was simply picking up garbage every day from my lawn and the street in front. Instead my knees are now shot from stomping and stomping trying to rid my property of them. 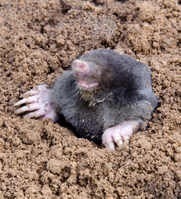 And as i work 12 hour days, 6 a week, i don’t have time to invest in being the mole watchman. I just ordered two of the choker traps and another out of sight style, and 48 more smoke bombs, hope something works for me, soon i’m gonna burrow into the ground like rambo and not return till i have a stringer of them! I highly recommend the Nash mole trap. I’ve had one for about 5 years and have caught many moles in it. Thanks for your feedback. It is always good to hear what is working for people.